Edition of 1226 of which 125 copies are signed 1-125, 26 copies are signed A-Z as artist's proofs; one is signed as a dedication copy, and three sets are signed as progressives. 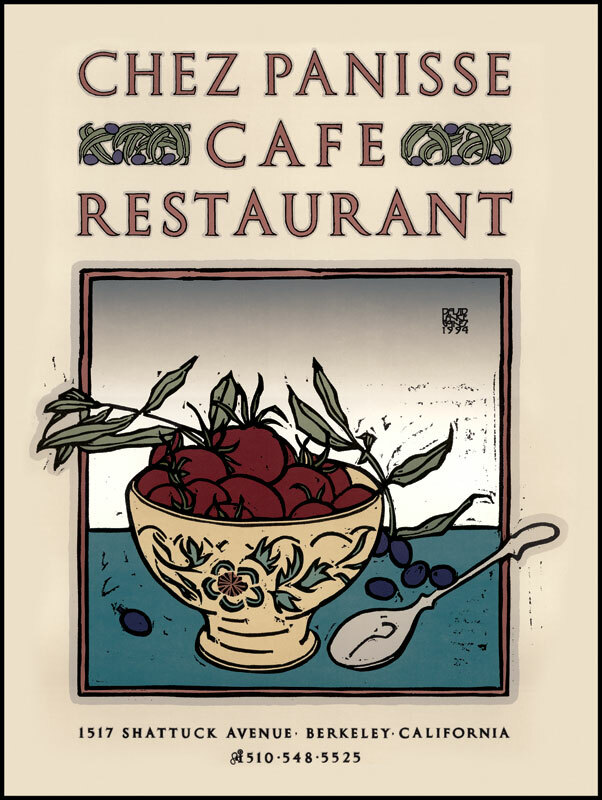 Twenty-three years of posters for Chez Panisse. Twenty-three years is a long time by any measure. Any way you cut it, any way you slice, chop, dice or julienne it; any way you roast it, broil it, fry or toast it; any way you pour it, freeze or serve it up on antique china with mis-matched silver; any way your smiling waiter-who wasn't even born the first day the restaurant opened and who now has graduated from college paying his way with work at this beautiful, hospitable place-serves your dinner to you. Time passes so quickly, you blink and open your eyes and a whole world has been transformed. Takes your breath away.